South Africa has been gaining a reputation as the home of bogus wildlife voluntourism projects. At the worst end of the scale are profiteering scams that abuse unsuspecting volunteers to walk, pet and raise lion and other predator cubs whose only purpose is to enrich the owners and be killed in a canned hunt as soon as the animals have outgrown their cute and cuddly stage. But there are genuine volunteering alternatives too, set up by locals and satisfying local need for help with wildlife research and conservation. A small project in the fynbos of the Western Cape shows how it is done. Dr. Alan Lee, a South African biologist, is currently hosting a group of seven volunteers from South Africa, Switzerland, the UK and USA at Blue Hill Nature Reserve to assist him for two weeks in his efforts to research and conserve the unique wildlife of the fynbos. But it does not stop just there. Dr. Lee aims to publish two peer-reviewed scientific papers as a result of the project, one on temporal patterns of abundance of medium- to large-size mammals from camera trap records, and the other on the Hottentot buttonquail, an endangered bird species endemic to the fynbos. This will add two more useful pieces of the puzzle to what is known about South African wildlife in academic and conservation circles. Dr. Lee enlisted the help of international volunteering non-profit Biosphere Expeditions in order to recruit his volunteers and help with the logistics of the project. Fellow biologist and executive director of Biosphere Expeditions Dr. Matthias Hammer says that “Dr. Lee’s project is a showcase of how wildlife voluntourism can and should work, and we are very proud to be associated with it. Peer-reviewed publications are the litmus test for genuine research and getting two out of a two-week project with seven volunteers shows exceptional, goal-oriented focus. It also corroborates what we call our stamp-collecting argument: That voluntourism in wildlife conservation works, because tasks are simple, but laborious and therefore often ideal for the involvement of volunteer citizen scientists. Add to this genuine local demand and community involvement through Biosphere Expeditons’ placement programme, hosting Khomotso Rammala, a recent biology graduate from the University of Limpopo on the project, and you have a small, but significant project that swims against the tide of charlatan and bogus voluntourism in South Africa”, concludes Dr. Hammer. 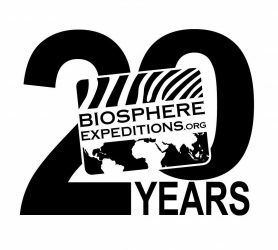 The next expedition to Blue Hill with Dr. Lee and Biosphere Expeditions will take place from 2 – 16 October 2016. In collaboration with the Landmark Foundation, the project focuses on monitoring two of Africa’s iconic cats: the threatened Cape mountain leopard and the caracal, in an effort to mitigate conflict with farmers and thereby contributing significantly to cat survival and their conservation. Working in the unique biome of South Africa’s Cape Floral Kingdom (fynbos) – a UNESCO World Heritage Site and the world’s only biome contained within one country – the project also conducts larger biodiversity surveys, focusing on cat prey species such as antelopes, as well as small mammals. The project’s ultimate goal is to develop a remote monitoring technique that will better inform landowners of the status of their prey wildlife and predatory cats, identify potential conflict areas, and use the knowledge gained to mitigate conflicts. At 1.2 million square km, South Africa is the world’s 25th largest country. It is incredibly biodiverse, with habitats ranging from forest to savannah, grassland, thicket, karoo, desert and fynbos. South Africa is also very rich in wildlife, and is a favoured Big Five safari destination. The core of the study site is the Blue Hill Nature Reserve, a 2,300 ha CapeNature stewardship nature reserve with mountains ranging from 1,000 to just under 2,000 m and under the care of the Lee family trust. CapeNature is the Western Cape provincial conservation department in charge of the network of nature reserves of the Western Cape. The property was purchased in 2009 by Chris Lee, a retired geologist who has been awarded the Draper Memorial Award for contributions to South African geology. The land was previously used for cattle ranching. It was incorporated into the local community conservancy in 2010 and officially declared a nature reserve in 2013. The trust has an obligation to manage the land for biodiversity under a management plan administered by Eastern Cape Parks and Tourism, the state organisation charged with managing the Baviaanskloof Mega Reserve. Blue Hill lies on the western side of the massive Baviaanskloof Mega Reserve and wildlife is free to move between these protected areas. The Baviaanskloof area is one of outstanding natural beauty, owing to its spectacular land forms, a diverse array of plants and wide variety of animals. The area is also part of the Cape Floristic Region World Heritage Site. Here is a photo from the camera trap taken at the cage the night after it was deactivated! The associated video shows the leopard spooking at the entrance, and not going through… but trust our luck…. We ended as we started, with a small transportation hiccup. The minibus driver managed to get himself lost on the way to Blue Hill. So we loaded everyone and their kit into two of the four wheel drives, and headed out to intercept the bus on a dirt road, and ensure that flights weren’t missed. I can hardly believe our first expedition in South Africa is already over. Let me start by thanking our team. First off, our volunteers, for being pioneers, willing to take the expedition leap of faith and believe in a new project – you’ve all made a great contribution (see below). But firstly, we owe a big thank you to the Lee family, particularly Anja, Eli and Charlie, and Chris and Elaine (our collective hosts) for your endless hospitality. Grateful thanks also go to Melda and Stefan, for the continual provision of culinary delights, and their botanical and camera trap ID wisdom! And finally, our enormous collective thanks go to Alan, our leader in all things scientific. It has been a fantastic privilege to share in your world. 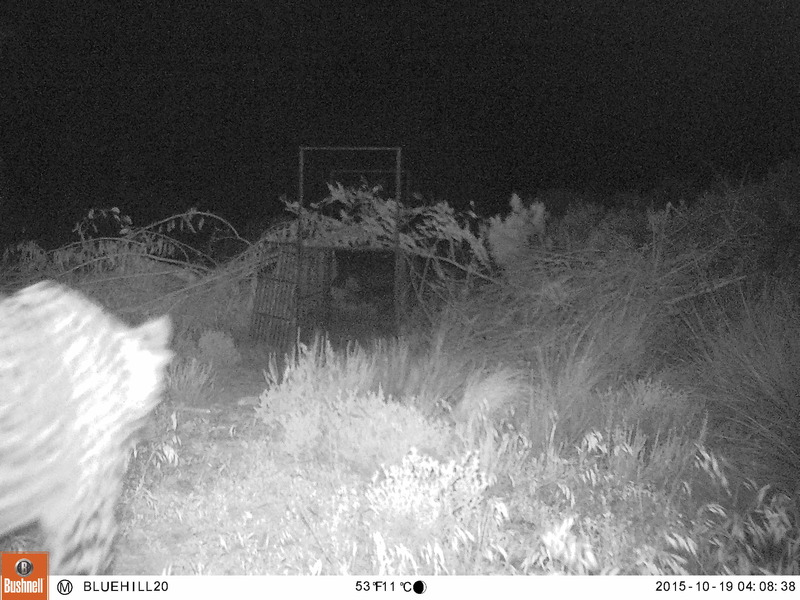 – 15 new camera traps have been deployed both across the Blue Hill area and in the Baviaanskloof, to monitor leopard, caracal and other mammal activity and movement patterns. – Over 3500 camera images from Blue Hill have be analysed, identified and catalogued, revealing activity of leopards, caracals and African wildcats across a number of locations. – 20 km of flush transects surveys have been completed across the Blue Hill area, and the first-ever flush survey was completed in the Welbedacht section of Baviaanskloof. – We completed the first series of small mammal trapping surveys in the Blue Hill area of the fynbos, and demonstrated the presence of Namaqua rock mice, which was previously unknown in this location. – We identified the location of more Cape rockjumper nests (a bird endemic to the fynbos), and installed camera traps to monitor chick development and feeding behaviour. – We completed more radio-telemetry surveys on tagged rockjumpers, to assess activity and distribution patterns. – We located an active nest of the endemic jackal buzzard, with two chicks and again installed a camera trap to assess prey species brought to the nest. – Four species of bat have been identified in a small survey area around Blue Hill, and a cave roost of the Cape horseshoe bat has been identified. – New locations and examples of rock art have been discovered. That broadly covers the headlines, but our work is still not complete. Data still needs to be crunched from the various field surveys and just think of all those new camera traps still clicking and collecting data….long beyond our departure. The keen-eyed amongst you will have realised that this is nine different, and in several cases, new achievements, in nine full days, by the collective efforts of nine people. Full marks and many thanks for this great contribution. Don’t forget to share your pictures and you’ll hear from us again when the full technical expedition report comes out in a few months. Safe travels home and we hope to see you on another expedition again at some stage, somewhere on this beautiful planet of ours. 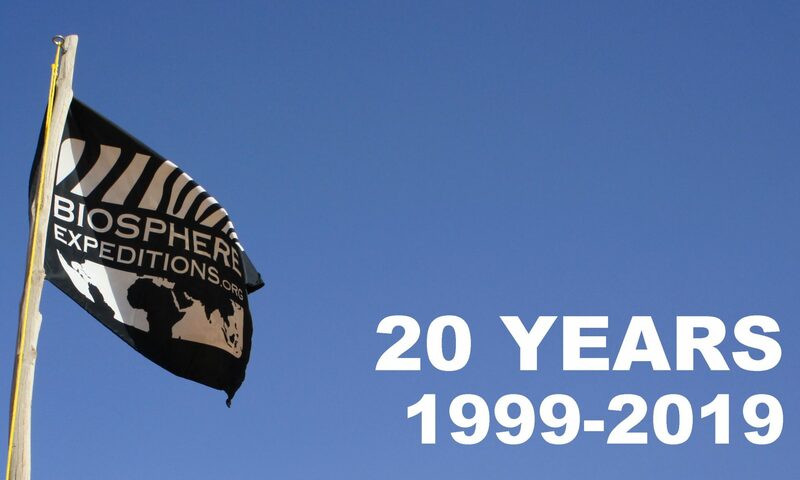 Many of us come on a Biosphere Expeditions project with a desire to contribute to field science and conservation. But we also come on expeditions for many other reasons and with different expectations – perhaps to meet new people, experience new places or see wildlife. The first two often begin to be realised, as soon as you arrive on the expedition site. But the latter takes time and effort and often it is too easy to focus on this at the expense of immersing yourself in the expedition experience as a whole. Here in the fynbos, we have all been fortunate enough to experience and document new species to each of us, whether, they be grysbok, sengi (elephant shrew), black harrier or some of the many flowering species. They may not always have been what we all hoped for, or expected, but nevertheless they offer something new – new data and new experiences. But this project has given us more; the opportunity to remove our biological blinkers and appreciate the wider setting at Blue Hill. Our field work, in the form of flush transect surveys and mammal trapping, has allowed us to appreciate the landscape and begin to marvel at the millions of years of geological history beneath our every step – gratefully aided by a presentation from Chris Lee (Alan’s Dad) who is a professional geologist. This also helps give perspective on the historic people of this land, through the observation of ancient rock art, which seems to adorn every cave wall or rock overhang – showing people, antelopes and big cats. Leading us to speculate as to who was here thousands of years before us, and how they interacted with the wildlife? And sometimes these differing interests collide. As an aside to our main work, we’ve been deploying a bat detector in the evenings, which has detected, amongst others, the endemic Cape horseshoe bat – a species which is becoming rarer. Alan, knew of a cave roost, but not which species inhabited it – cue a mini expedition to the cave. Whilst we could confirm the presence of horseshoe bats, the use of high power spotlights also revealed more cave art, not seemingly visible in daylight; and not previously known to Alan. In just a few moments, we had learnt more about the Blue Hill area than any of us expected. But also realised there was so much more to learn. The fynbos is famed for its wildflowers in all their diversity and beauty. There is no doubting we are working in a Floral Kingdom – the Cape Floral Kingdom to be precise. It is easy to obsess about charismatic species at the expense of others and whilst we may not exactly be tripping over leopards, caracals, kudus or klipspringers, we are surrounded by a wildflower wonderland. And once you start looking at them, I mean really looking in detail, they reveal all manner of shapes, sizes and colours. In many respects, flowers power the fynbos. Several small mammals (the subject of our trapping studies) are reliant on protea flowers for food. Many species of butterfly, moth and horseflies are specialised for extracting nectar from tubular flowers and at the same time perform a pollination role. While orange-breasted sunbirds and Cape sugarbirds, which are endemic to the fynbos, not only act as pollinators, but the latter relies on proteas and pincushions for food and shelter. All of this is vital as it underpins the charismatic species that we seek. Once you stop to look at the flowers and your immediate environment, you begin to discover a variety of other species, whether they are birds, insects or amphibians, and interactions between them. An eye for such detail is a great asset for field work. Such an approach, lead one of our volunteers (Marty), to discover an active nest of the Cape rockjumper – another bird species endemic to the fynbos. This species also forms part of Dr. Alan Lee’s (our project scientist) ongoing studies. The nest had three eggs, which hatched the next day – the first time both have been recorded. And this is only the fourth active nest to be recorded at Blue Hill. All important data. Camera traps have now been set around the nest to record the chick development, resource provisioning by the parent birds and any nest predation. Time and imagery will advance our knowledge. It is amazing what you can learn by just looking at the immediate world around you. For all the technology that could be deployed, to record a host of environmental parameters and species movements, there is still no substitute to spending time in the ‘field’, simply observing. We are here to find predators, as the title of this project may suggest – ‘Carnivores of the Cape Floral Kingdom’. Trying to track down leopards, caracals and even wild cats, would normally involve a combination of hard work, patience and luck. So no easy task; and only the ‘lucky’ will encounter them face to face. However, we have technology on our side, in the form of camera traps. These clever boxes can be deployed to a range of locations and left to merrily take images of whatever happens to walk by them. That way, we can have ‘eyes’ in the field in multiple locations, over a huge area and every hour of the day or night. One of the jobs of the team has been to deploy yet more camera traps to add to the existing network, collect in others, and begin to analyse several thousand photos already taken. This digital imagery is a gold mine of data. Once species in images have been identified, and hopefully sexed and aged, we begin to open a new window on the fynbos world. We can begin to deduce what species occur where, their relative numbers and how this changes over time. A large catalogue of images can enable us to deduce patterns of activity over 24 hour periods, and distributions over wider spatial and temporal scales. Our team have already analysed over 2500 images in the first few days. All providing vital data and insight into the ecology of this unique environment. Yes, the cameras have recorded many of our target species, including grysbok, rhebok and duiker, but they have also revealed lesser known species such as aardvark, honey badger and porcupine. And one of the recently collected cameras has already documented one of our target predators – African wildcat, whilst we’ve been on expedition. Our knowledge will only advance as we capture and process more images between now and the end of the expedition. Camera traps are a great tool for conservation, but there is still no escaping the need for fieldwork (fortunately), and the need for hard work, patience and luck. Let the science commence! With the training completed on the various methods, our surveys could begin for real. For the next few days we’ll be ‘hunting’ high and low to find the mammal fauna of the of the fynbos. The first job of the day is always the leopard trap – a large cage trap, which will hopefully tell us which of the cat species is moving through the local area. But we’ll also get some interesting by-catc, and the last couple of mornings we have trapped grysbok – a small antelope almost entirely restricted to the fynbos vegetation. All are released to continue on their way. Our day yesterday then continued with flush surveys. Basically a large transect survey, with multiple people, whereby we can document the mammal and birdlife in a specific area. Our first survey was in the Welbedacht section of Baviaanskloof. It also gave the team an opportunity to deploy a few more camera traps to hopefully catch the elusive and wide-ranging leopard. Whilst the science went to plan, the transportation was a different matter. Our local ranger, Eksteen decided that he and Christine would take the vehicle to meet us at an entirely different point to one agreed with our scientist, Alan. The upshot meant a long walk out of the survey area and a late lunch. Though we took the opportunity to drive through the Nuwekloof pass – a stunning rock canyon where stumbled across two leopard tortoises in a rather noisy embrace! In addition to getting the flush surveys underway, we also now have 50 Sherman traps deployed with half of them up the now infamous protea slope. Locating the pre-marked trapping points in head height protea bushes is certainly a challenge – think needle in a haystack on a 40 degree slope. But as with much scientific survey work, hard graft usually pays off. We’ve already been rewarded with several captures, including a species not on our provisional list, though we await confirmation. The first volunteers of the inaugural ‘Carnivores of the Cape Floral Kingdom’ expedition all arrived on Sunday with only a minor glitch of getting one vehicle stuck just a couple of miles from the expedition base. Welcome to expedition life! With initial introductions, risks assessments and briefings completed by Sunday afternoon, we stretched our legs with a brief orientation walk around Blue Hill Nature Reserve – our base for the next 12 days. We passed by (and checked) the leopard trap, which will form a key part of the survey work, and enjoyed some of the local wildlife whilst on route. Sightings included klipspringer, jackal buzzards and an ancient relative of the elephant – the dassie or rock hyrax. This was followed by another orientation walk up a ridge behind our base. The climb rewards you not only with a great view over the fynbos landscape, but also with a mobile phone signal. I have a feeling the path will be well–trodden by some! Rested and recuperated from Sunday’s travel and briefing exertions, the science training than began in earnest on Monday, with camera trapping analysis and mammal ID work. Practical session came in the form of off-road 4WD training. Our three transport options on the project are either by foot, by 4WD or by mountain bike. All vehicles and drivers returned to base in one piece. So far there have been no riders. With equipment briefings completed and after-dinner lectures from our project scientist (Dr. Alan Lee) digested, we put things into action on Tuesday. The sunrise activity of trap checking yielded a klipspringer in the trap, which was promptly released. Unfortunately it broke a horn in the box trap, something that happens very rarely, but did this time. Alan was worried, but the klipspringer seems to have been fine. Later in the morning we practised setting 50 small mammal traps in a big group. It took us about three hours, so a couple of people should manage in an afternoon, especially because we have already marked and recorded the fifty locations now, covering a big rectangle of 250 x 1000 m. In the afternoon we conducted our first ‘flush survey’ in a group of seven walking all abreast and 2 m apart, recording vegetation and any animals that are disturbed and ‘flushed’ out of the undergrowth. Christine, who had twisted her ankle just before the expedition, and her husband Prasadu stayed back to go through camera trap pictures collected by Alan in the past. This will be another key activity where we can help Alan do things that he would not be able to do without willing volunteers, in this case because he simply lacks the time to go through 3000-odd camera trap photographs. But split over two weeks amongst seven volunteers working in shifting pairs this task become manageable and the end result, Alan hopes, will be a peer-reviewed scientific publication on “temporal patterns of abundance of medium to large-size mammals from camera trap records” (that already sounds very scientific, doesn’t it ;). When Matthias and I touched down in George on Wednesday, it was horizontal rain, 13 deg C out of the wind, grey skies and freezing in the wind. The drive to base was wet and long and we were late. Today the skies are blue and it is 25 deg C outside. This changeable weather is nothing unusal for the Cape fynbos mountains. The forecast matches this: a mixture of sunny days and rain. Alan says it’s impossible to predict for more than two days anyway as the mountain weather is so variable. But even with blue skies and warm temperatures outside, the stone houses of our base are cold, and the stone floors are freezing, so do come prepared with slippers. Anyway, we’ve spent the last two days getting ready for you. Finishing the day-to-day plans, research activity schedules, orientation briefings, equipment, rooms, etc. We are aiming to be all done by tomorrow lunchtime. Matthias will come out and meet you in George and make sure the transfer to base goes as smoothly as possible. Alan, Anja (his wife), Eli & Charlie (their children), the rest of the staff and I are looking forward to meeting you in a couple of days.